Tempo modules can be synchronized to the frequency of a FrequencyDivider. If the FreqDivider gets clock messges from a MidiClock module, it’s sync mode should be set to “int” by all means, because MidiClock messages derived from the host seq are unstable, producing unstable delayTimes and unwanted crackles. A Stereo Delay with (optional) cross feedback. In manual mode, max. delay time is 4000ms; if synchronized to MidiClock, longer delays can be achieved though (eg 120bpm, freqDivider24/256=> max. delay time is 5333ms). Modulation speed can be synchronized to a MidiClock signal. Otherwise same as standard Flanger module. Modulation speed can be synchronized to a MidiClock signal. Otherwise same as standard Phaser module. This delay samples incoming data and overrides them with a looped version of itself. -The length of the loop is determined by the delay’s time settings. -To hear the desired effect, a gateOn message must be received. -On gateOff, the dry input is connected through. -Sustain: feedback amount. Caution, possible fb overflow! 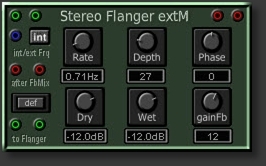 any module/pair of modules can be plugged between internal flanger and feedback (eq, delay...). With option to invert signal.